upsss and 5 Guests are viewing this topic. Certainly going headless, button-less and USB-OTG seems a good conversation to start, but maybe not here in a support thread. I'm looking to buy one of these testers but there is so much stuff on eBay that I don't know what to choose. Can you recommend me the best one? Yes, that appears to be an AY-AT. Just bought one of these from AliExpress. How much Russian text should there be? I have quite a lot of text in Russian, although the test output is in English. Continuing from this post, the st7735 is getting powered from two sources. Can I replace 3v3_z14 zener with a 1/2w watt resistor? But I dont know the current consumption of pin 10+11. Could not find it in the datasheet. I looked at the schematic posted here. There are two types of st7735 - a readymade version with male headers and the bare lcd version(found in fish8840tft) which is cheaper to buy from aliexp. The person who made this schematic has used the first version and using an LDO(ams1117 3.3v). He/she has also added a few higher value capacitors(marked in red). My bro give me this this. T4, right? what i must do then? the closest search, give me tom666 post. I think, still have arduino uno. Its right? or any other option for the latest firmware? what the right? its hard to learn how to flash to that? notes : Me are noob in electronic. This would be a bad idea since the LCD isn't a constant load. The current consumption changes with the operation mode and a few settings. A zener or LDO is the right way. 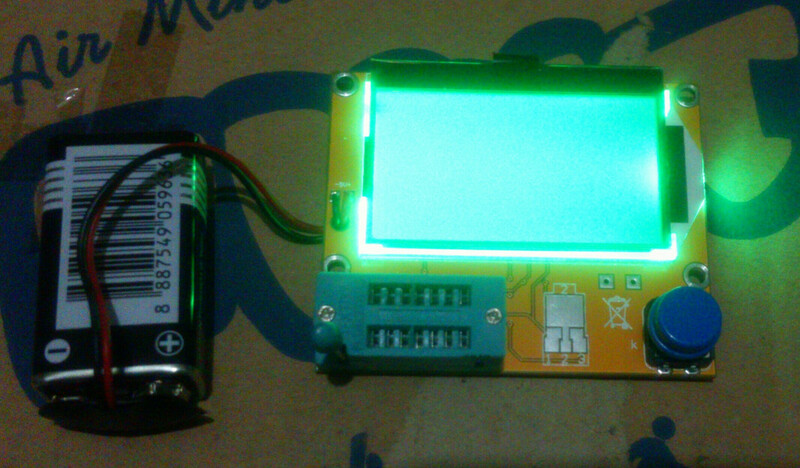 Yes, you can use an Arduino as programmer. You'll find tons of guides about programming an ATmega MCU in the internet. There are also a few guides in this thread. I made the schematic of fish8840tft(using this post) + mt3608 module. Im attaching the files(altium) if anyone is interested in poking around. Kindly correct mistakes if any. I have an old transistor tester that has the 3 screw type connector. Is there anyone that know if a adapter board exists for me to install a zif socket instead for the 3 hole screw type connector? I have an AY-AT 328 tester (Supposedly the Bees Knees at the moment) and it’s almost built, but I’m in need of some info on the small 6 legged device that is an SMD and is situated with the other 2 SMDs at the bottom of the board and is marked with MC5 on the top of it. It is between the left blue 2way Connector Block and the Clamping Tester Block (Sorry, don’t have the name to hand). Any help would be much appreciated. Many thanks anyway. I wouldn't have thought that you would have the space anywhere on the board to fit one. Another way would be to fit speaker clamp connectors as they are smaller. Hope that helps. Yah the space is there...all I would need is a daugtherboard to take a 14 pin connector down to 3 .........must exist? The ZIF socket wiring just shorts some of the pins together as shown in the various circuits posted. You could just solder the ZIF to some vero or perf board for mounting and then wire the pins together (as per the circuits) and solder the 3 wires to take back to your tester. I think the circuit drawing you inserted is not correct. Based on the pinouts and there being no current limiting resistor as part of the voltage divider (together with the Zener) for the 3.3V supply it is unlikely to be a Zener but more likely a 3.3V LDO regulator (like the amd1117 3.3v you mentioned later). You can't replace it (even if it is drawn out correctly) with a resistor. Thanks for the info, it was in front of my eyes all the time, thought that number was something else to do with the board but there you go. I'd have never got it as I'd already dismissed it previously. Your help is much appreciated. sorry, too excited, eureka moment noob. hehe. avrdude: ser_open(): can't set com-state for "\\.\COM4"
avrdude: reading input file "TransistorTester.hex"
avrdude: reading input file "TransistorTester.eep"
So, what happen? trouble with lcd? on what? and how to fix? That should be much more (about 700 -1000 bytes). Did flash some friend T4 (strip) and my T4 (no strip). My T4, still no output in LCD. I think broken connection or something. Just Led ON only. What you suggest? T4 again or what? i have seen what looked like a dead unit that just had VERY low contrast.